I wasn’t able to do a Pay It Forward Friday post last week. Here is this weeks randomness. I hope you enjoy! First up we have ana at i made it so. What can I say about her? She is very creative and gives great ideas. She types in lower case. 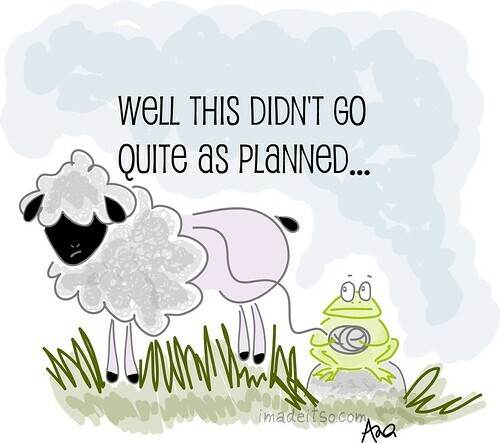 She made the cutest images for people with ravelry accounts to use when they don’t have pictures of their project yet, or are just plain embarrassed to show their project. It follows that she is also a knitter. She is a great writer and I love reading her posts. You should read them too – she explains herself a lot better than I ever could. Do you live in Winnipeg? Are you looking for what is the BEST and most unique wool shopping experience in Winnipeg? Then go to Where The Wool Things Are at 61 1/2 Albert St. It is a wool store combined with a korean fusion café called Kimch’i on Albert. The wool is beyond gorgeous, my personal favourite is the Dream in Color Classy line, and the food is to die for. My best tip: go there early on the days that the mac and cheese is on the menu! It is a super filling plate full of deliciousness and I guarantee you that you’ve had anything close to it before! If you are a knitter in Winnipeg, you should drop by on Thursday nights where Mariver, the owner of Where the Wool Things Are has started knit night. It’s an awesome gathering of Winnpieg knitters. I haven’t been able to go for the past little while but the knitters I have met through her are awesome people and I miss it so much. Knit Nights usually have a theme, check out the blog to see what the latest theme is before you head down there on a Thursday night. (p.s. come hungry because there are usually snacks AND the smells from the Kimch’i side will have you ordering food whether you are hungry or not!). One of my favourite undiscovered shops on etsy is umbu. 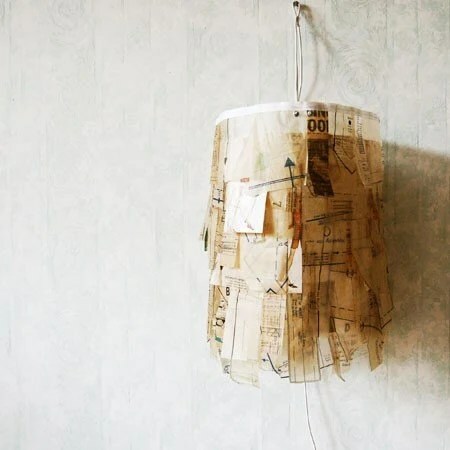 It sells the most gorgeous lamps crafted from recycled materials such as: sewing patterns, wrapping paper, newspapers, magazines, and maps. Each lamp description lists exactly what materials it was made with. This shop also have clever written magnets that are hand shaped out of clay! Please, please, please check this shop out because it is so incredibly lovely! And if you want, you can buy me the “clean me’ magnets! Or, if you’re feeling really generous, the sewing pattern lamp that is to the left! Thanks! This entry was posted on December 3, 2010, 7:00 am and is filed under Pay It Forward Friday. You can follow any responses to this entry through RSS 2.0. You can leave a response, or trackback from your own site.